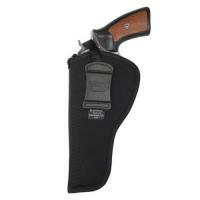 This tough nylon holster from Blackhawk is designed to fit the Smith & Wesson X-frame family of large revolvers, allowing a far more secure fit than a generic style.The hip holster design hangs from the belt and offers quick and unobstructed access to the weapon for a fast, reliable draw. The rugged 1000 denier CORDURA outer offers superior protection and can withstand even the most challenging conditions without tearing or fraying. A nylon web strap holds your firearm securely inside the holster at all times, even during vigorous activity, ideal for law enforcement or handgun hunters.